Sunday UPDATE: Tony Stark will indeed return. That on-screen assurance at the close of Iron Man 3 is – if there were actually any question – fully insured after a monstrous 3-day take of $175.3M. The sick sum gives the soaring billionaire bad boy the top two slots on the all-time opening list, with The Avengers' record rake of $207M safe until its sequel drops in 2015. How monstrous has IM3 been worldwide? $505M large, with a final global take of $1.3B (yes, billion) looking to be a lock. Tentpole films don't get any more colossal than this. 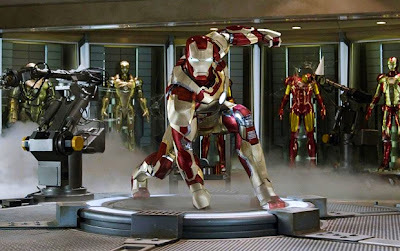 Iron Man returns for his third solo - fourth overall - big screen outing this weekend, and the sky's the proverbial limit for the dude encased in a suit constructed of rocket-boosted, repulsor ray-blasting armor. While it won't soar to the same stratospheric level as the record-setting The Avengers in its debut frame, Iron Man 3 has a shot at nearing the $200M mark. I'll take it a bit below that figure but a bullish projection nonetheless.